Jeanne Dielman present a reissue of Donald Byrd's Byrd In Hand, originally released in 1959. 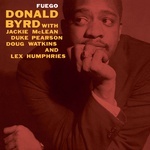 Recorded in 1959 at the legendary Van Gelder Studios in Hackensack, New Jersey, this is considered one of Donald Byrd's finest LPs. The then 27-year-old trumpeter had many LPs under his belt already, but this was his second on Blue Note, where he would stay for decades and release the best music of his career. 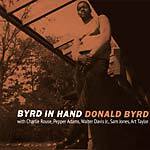 Byrd had a fruitful run in the late '50s with the great baritone saxophonist Pepper Adams and here they are joined by long-time Thelonious Monk Quartet tenor-man Charlie Rouse, and a great rhythm section. After a rousing take on Sinatra's "Witchcraft" the record features three strong Byrd originals and two compositions from the group's pianist, Walter Davis, Jr. A hard bop classic from one of the strongest players of the era. "Free Form is, perhaps, Donald Byrd's finest LP. Featuring a unreal band that included Wayne Shorter on sax, Herbie Hancock on piano, and Billy Higgins on drums, this 1961 set from the Detroit born trumpeter showcases his versatility and adventurous spirit. Equal parts sensitivity and severity, bopping and exploratory, Byrd moves between hard and post-bop and more modal song forms with ease. Includes a bonus track left off the original album but from the same sessions, a lovely Herbie Hancock penned cut! A stone cold jazz classic reissued on LP by Doxy." "Originally released in 1961, Royal Flush was trumpeter Donald Byrd's eighth album for Blue Note. During this period, Byrd--who was then perhaps the finest living hard bop trumpeter--had begun concentrating his efforts on a quintet formed with baritone sax player Pepper Adams. Featuring Butch Warren on bass and Billy Higgins on drums, the quintet was most notable however, for introducing a 21-year-old Herbie Hancock to the jazz world, in his first ever recorded session! The album also features Hancock's first recorded composition, "Requiem". Hancock's first session as leader would not appear until the following year with 1962's Takin' Off."